The Contented Dementia Trust, formerly known as SPECAL, is an independent charitable organisation with an innovative approach to the care of people with dementia. to ensure that the person with dementia, and their carer, can lead as close an approximation to the life they would have wished to live without dementia. to ensure that the impact of the specific memory change experienced by people with dementia is clearly understood and taken into account in the design and planning of dementia services. Follow Contented Dementia Trust on Facebook. 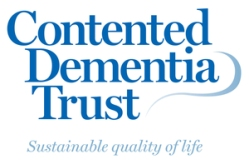 Follow Contented Dementia Trust on Twitter.